Flush your TV to the wall with this fixed flat panel wall mount by Sonax. Designed for TVs 18-32 this low profile mount sits just 1.9 cm from the wall for a close custom fit. Complete with a built in levelling system for easy DIY installation and a locking system so you can be confident your TV is safe and secure. This discrete low profile design is the perfect solution to customize your home interior and compliment your new flat panel TV. For a polished look pair this wall mount with your favourite Sonax TV or component stand. This CorLiving Full-Motion Tilt and Swivel Wall Mount is ideal for most flat and curved TVs 23"- 55" weighing up to 35kg/77lbs. Five direction tilt ensures optimum viewing angles. VESA compliant adjustable design extends from 58mm on the wall up to 282mm, has intricate horizontal TV level +5:~-5:, swivels 90: left and right and tilts up and down +5:~-8:. Built with a solid powder-coated steel frame, this TV mount is built to suit any occasion or entertainment room set up. The cornerstone of the satin Collection is quality, and this outdoor wall mount is no exception. Combining a classic bronze finish and posh styling, you will find no better way to highlight the charm of your home. With the superb craftsmanship and affordable price this fixture is sure to tastefully indulge your extravagant side. The MTM82PL provides a safe way of maneuvering your TV around any home or office setting. Its steel frame is quick to assemble and features 3-inch rubber casters to smoothly roll it between locations. Along with a top shelf suitable for a webcam, the MTM82PL includes a height-adjustable plastic tray to conveniently carry your laptop, PVR, or other digital devices. It also features telescopic center columns that offer 20 inch of height adjustment and include integrated cable management for an exceptionally tidy setup. To ensure your TV and accessories remain secure, each wheel includes a quick release lock that can be easily applied and released with your foot. Achieve an ultra-low-profile setup with the R300 recessed wall mount. Designed to be inserted between two studs measuring 16" apart, this unique mounting solution lets your TV sit 1.25" from the wall when fully retracted. Its 18.5" long articulating arm provides -50/+100 of tilt and 1800 of swivel, ensuring optimal viewing from all angles. 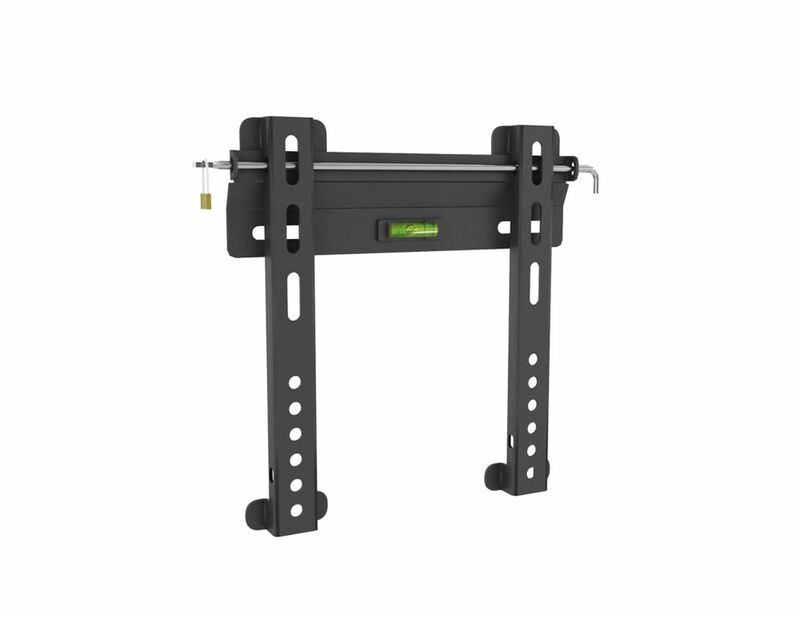 Built out of high-grade steel, the R300 supports 32" to 55" TVs weighing up to 80 pounds. E-0056-MP Fixed Low Profile Wall Mount for 18" - 32" TVs Flush your TV to the wall with this fixed flat panel wall mount by Sonax. Designed for TVs 18-32 this low profile mount sits just 1.9 cm from the wall for a close custom fit. Complete with a built in levelling system for easy DIY installation and a locking system so you can be confident your TV is safe and secure. This discrete low profile design is the perfect solution to customize your home interior and compliment your new flat panel TV. For a polished look pair this wall mount with your favourite Sonax TV or component stand.